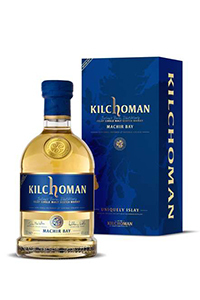 Machir Bay is the beach on Islay just down the road from the farm where Kilchoman is located, and this expression was introduced in 2012 as a tip of the hat to a favorite spot for Ileachs to relax. The 2013 Machir Bay expression differs slightly from the original, in that it uses whisky from 4 and 5-year-old ex-Bourbon casks finished for four weeks in ex-Oloroso Sherry butts. The original used a vatting of 3, 4, and 5-year-old casks. The 2013 edition will be available starting March 4, with global distribution expected at a suggested retail price of around $60 USD per bottle.